When my sister Kris and I were kids, we were big fort builders. We were always crouching in a fort under a tree. We built a great succession of forts, little lean-tos concocted without nails or screws. We’d usually stay in each place for about six months or so, and then we’d move on. That is, until we built Mintwood, Mintwood Estate. 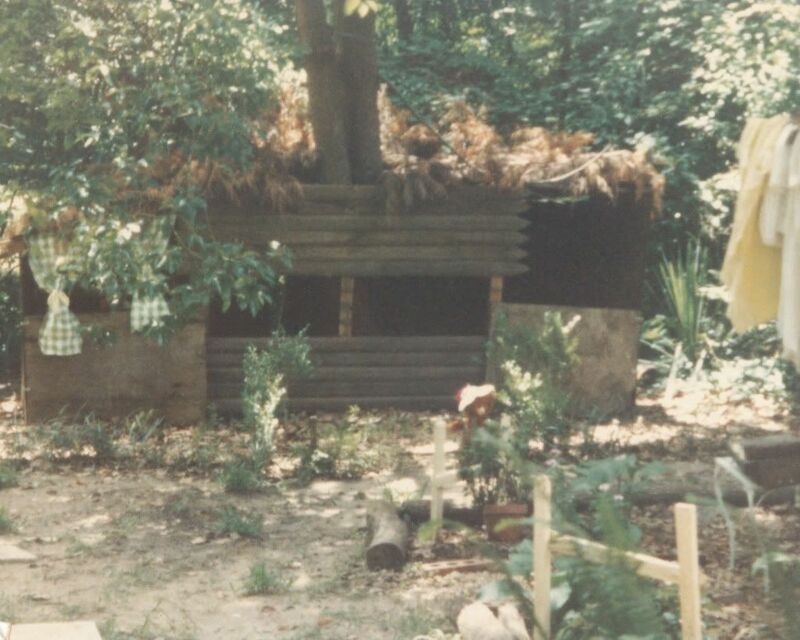 Our last fort, our best fort, it stood—well, leaned—for years against a camphor tree in the very back of our backyard. Since we didn’t know the name camphor, we called the tree a “mintwood” (because of its scent), and the fort was named after the tree. 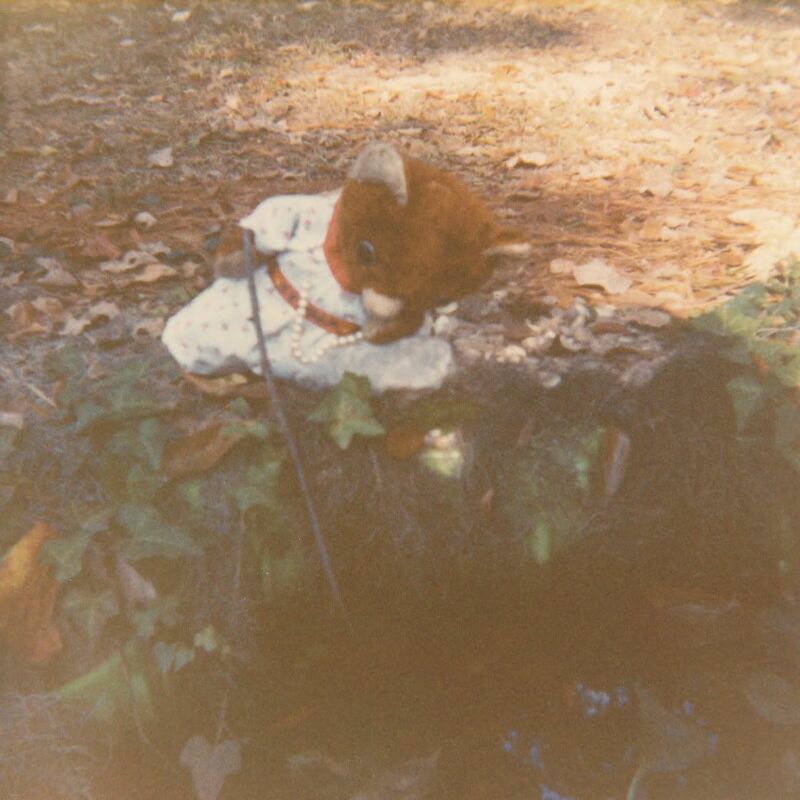 That’s Fenna, our stuffed bear, standing outside. She was a wonderful character, sort of like Miss Piggy and Rodney Dangerfield mixed together. She was hilarious and insecure, ambitious and always thwarted. She wanted to seem rich and glamorous, but she was constantly being undermined—by us, Kris and me, who played her dorky mothers (yes, for some reason Fenna had two mothers). That’s Fenna again, sitting at her vanity table. Her bed, with the red chest at its foot, is behind her. Nearby you can see the couch (hand painted) and the dining room table, which is set with plates of mushroom stew. We built all the wooden furniture ourselves, using our rudimentary carpentry skills. Mintwood was surrounded by elaborate (and hilarious) gardens. There were beds outlined with logs . . . and some with oyster shells. We created a sort of living fence around the whole place with a long, curving line of plastic pots filled with impatiens. We lavished those impatiens with so much tender loving care. We were constantly watering them and pinching them back and giving them liquid fertilizer. 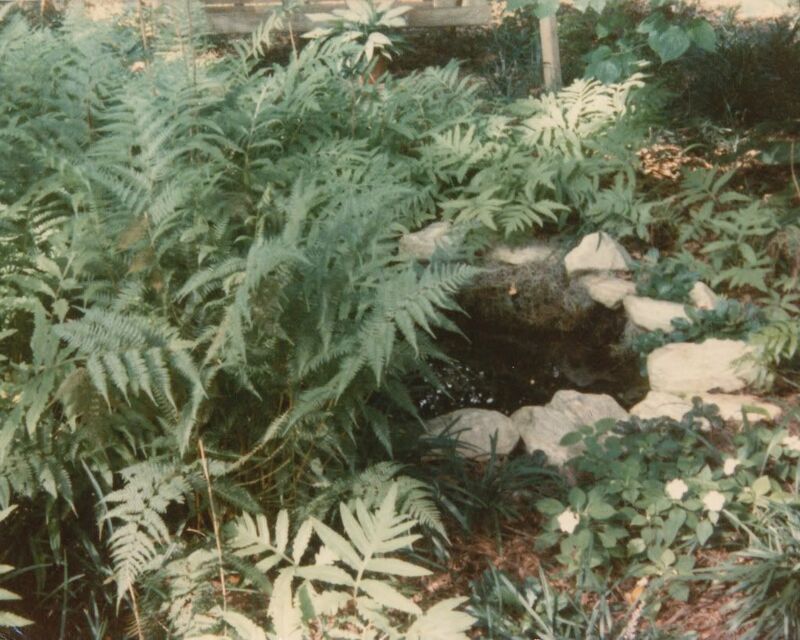 The pond improved over time. We added more moss to the sides, and we decorated the edges with marble rocks purchased for a song at a place that sold gravestones. Tadpoles and snails appeared like magic, and for a long time a big bullfrog hid among the rocks. I can still remember the lovely plopping sound he made whenever he jumped into the water. Oh, my gosh! These pictures are so awesome! I want to see more! Oh, good! I will keep posting! How precious to have photos of your fort! 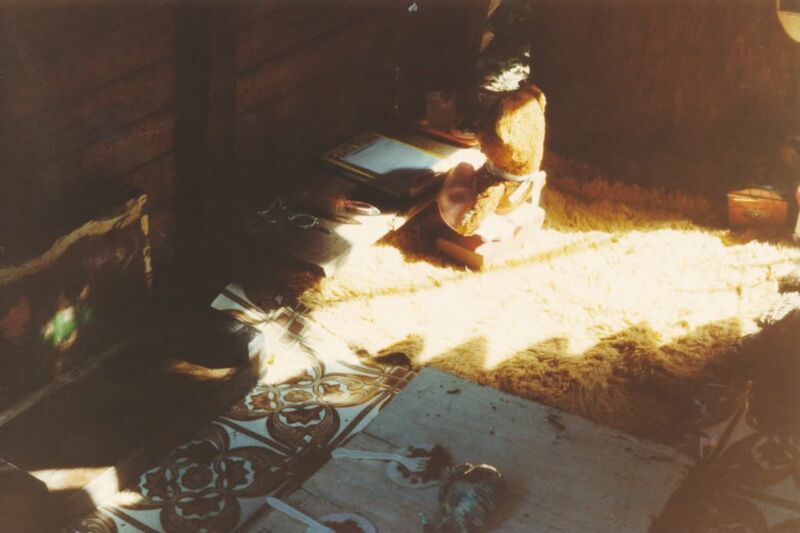 As I child I lived in my tree-house up until we moved (about age 9) - at which point I was always building forts in and around local rock pits in the Miami area - or often times in my own backyard. I cringe at the idea of my kids doing that now (different world "way" back then). Oh neat, Eli. Childhood was really great back in the "old days," I think. We really had adventures.